Since now that you have either the VHS tape or DVD of Lilo and Stitch. . .
now you can go look for trivial and hidden things and contiguity problems in the movie. June 20 - Memories, Lilo and Stitch Premieres! A year ago today (June 21, 2002), Lilo and Stitch premiered to the world! It was a close openning weeked for the Lilo and Stitch gang as they dueled against Tom Cruise's Minority Report. The final result was "Minority Report" Tops "Lilo and Stitch" in Photo Finish. June 15 - Memories, Happy Father's Day! A year ago today, on Father's Day (June 16, 2002), it was the World Premiere of Lilo and Stitch. Check out the chorus's performance(14 MB). A year ago today (June15, 2002), The dress rehearsal and the taping for the ABC Lilo and Stitch Special happened at the El Capitan Theatre. Check out the practice(27 MB) and the dress rehearsal(21 MB). A funny thing. . .1 year ago today, the Lilo and Stitch soundtrack gets released on Kamehameha Day! So sing along to He Mele No Lilo and Hawaiian Roller Coaster Ride once again! 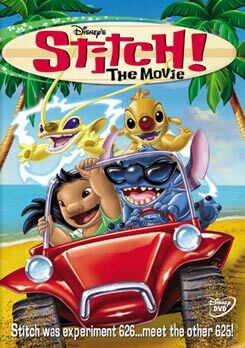 A year ago today (June 1, 2002), Hawaiian began to promote Lilo and Stitch on its inflight video programming, as well a playing the soundtrack as part of their inflight audio programming. And if you didn't hear about it, Hawaiian Air also won an award for the promotion of Lilo and Stitch. The original Lilo and Stitch soundtrack offical release date was June 11, 2002 - Kamehameha Day! The recording of He Mele No Lilo was recorded on December 3, 2001. Then one year later the DVD and VHS tape gets released on the same date! Interesting huh! ?